While browsing other genealogy blogs, I came across the Auld Genealogy blog that had a “Trove Tuesday” feature. 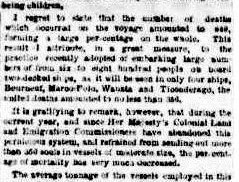 This led me to think about what information there might be in newspaper articles that I hadn’t yet looked for, and I decided to do a search for information on the “Wanata”, as one of my ancestors, Robert Harley, had travelled with his wife and infant daughter on this ship. I therefore decided to make Robert Harley my ancestor for this week. In 1991, when I first started contacting relatives for information on their families, I was sent an extract from a book a distant cousin (Donald Stevens) had been writing on the Harley family. Sadly, he died before the book could be published, in 1984. Included in this information was an account of Robert and his wife Euphemia’s voyage to Australia. The following is a summary of the information he had found. Robert and Euphemia, with their infant daughter Margaret, had sailed to Australia on the “Wanata”. Margaret died of fever on the voyage. The “Wanata” left Liverpool on 19th June 1852, with 820 emigrants on board. 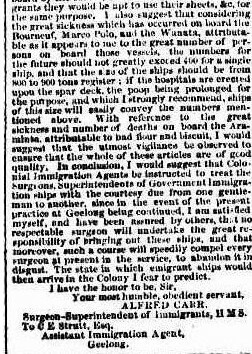 They arrived In Port Phillip Bay in September 1852, and anchored off Gelibrand Point (near Williamstown). During the voyage, there were thirty-nine deaths. Thirty-three of these deaths were children. Of the six adults who died, four had died from fever (probably typhoid). The ship was therefore placed in quarantine after arrival. It was proposed to lift the quarantine on September 23rd, but a new case of fever was reported. All the sick passengers were then transferred to another ship, the “Fanny”, and the “Fanny” was then also placed under quarantine. On October 4th, the quarantine on the “Wanata” was lifted, and the “Wanata” joined the other ships in the Bay, and arrangements were made for the immigrants to disembark. I found a number of articles with reference to the “Wanata” on the Trove website. The following are those that I found of most interest. This first article is about the arrival of the “Wanata”. The full page can be viewed at http://nla.gov.au/nla.news-article60132874.